I have some free time until my job starts in just over a week, so I’ve been enjoying a few weeks free from both school and work. Today I decided to go on a thrifting adventure. I’d heard that the local Salvation Army is pretty good in terms of vintage items, but I had not yet checked it out for myself. I finally ventured over there myself, and it did not disappoint. 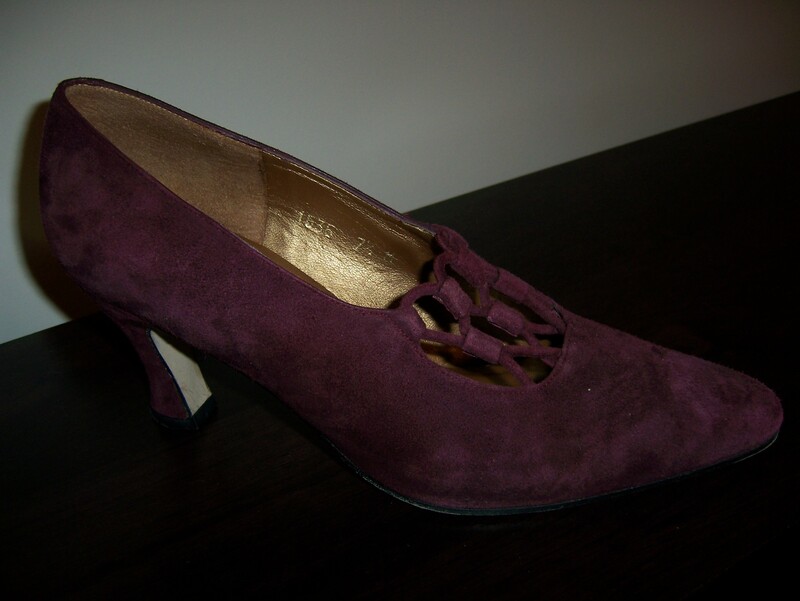 I came away with these gorgeous vintage Evan-Picone dark purple Lattice Pumps made in Spain. A little internet research revealed they are from the 1980s, which is what I guessed. I found them for sale online in a different color for $42. My price? $4.50. I’m very excited to wear these in the future. I never thought I would thrift shoes, but these are in excellent condition. Fun Detail or Too Much Trend? My fashion style tends to lean toward classic pieces, but I do enjoy incorporating current trends into my wardrobe as well. I like to mix fun trendy pieces with the classics because they gives the classics an updated look. The use of the classic or traditional pieces, meanwhile, keeps the outfit from becoming too trendy. One current trend I’ve been wanting to try out for a while now is the open weave tight. I received open weave tights as a Christmas gift, but never wore them until this week. When I get something new that, in my mind, is “trendy,” I always feel a little self-conscious about wearing it for the first time. I’ve learned to get over that though because chances are no one else is noticing it or thinking about it as much as I am. I’m sure a lot of people experience this. Sometimes even once you get over the fear of worrying about what others might think, you still feel somewhat uncomfortable with it–just because it’s something new. There are some tricks you can try to minimize your discomfort. I find for myself, once I get past that initial wearing, then I feel free to wear the item however I want in the future. Anyway, to get to the point, this is how I was feeling about the open weave tights. They were something new to me, plus I was concerned about making sure they remained work appropriate. 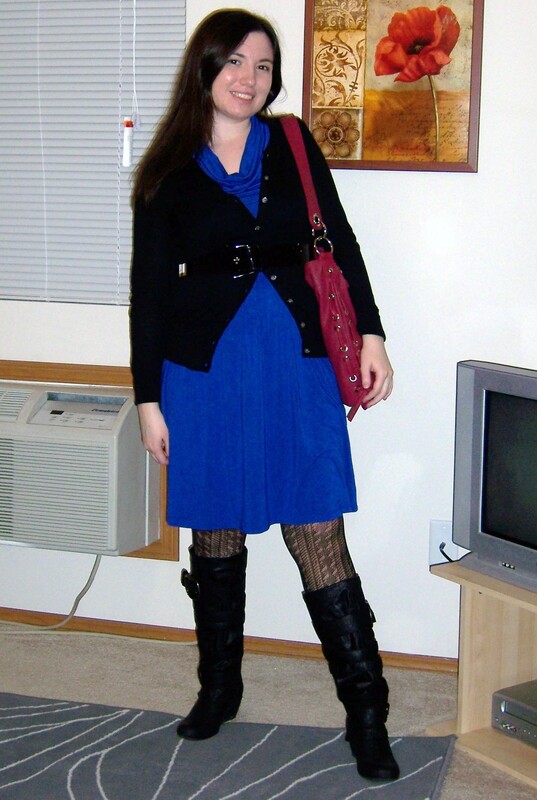 As you can see, my solution was to pair the tights with a longer length dress and tall boots. This minimizes the amount of the tights actually visible. 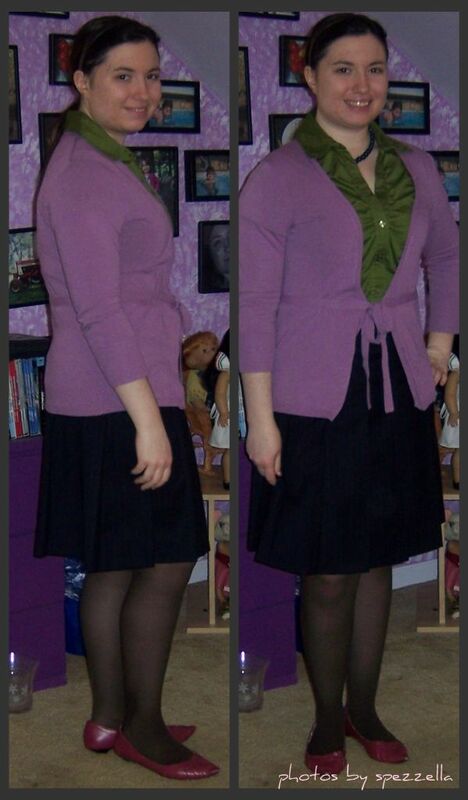 By doing this, the tights become a fun little detail, rather than overtly trendy. 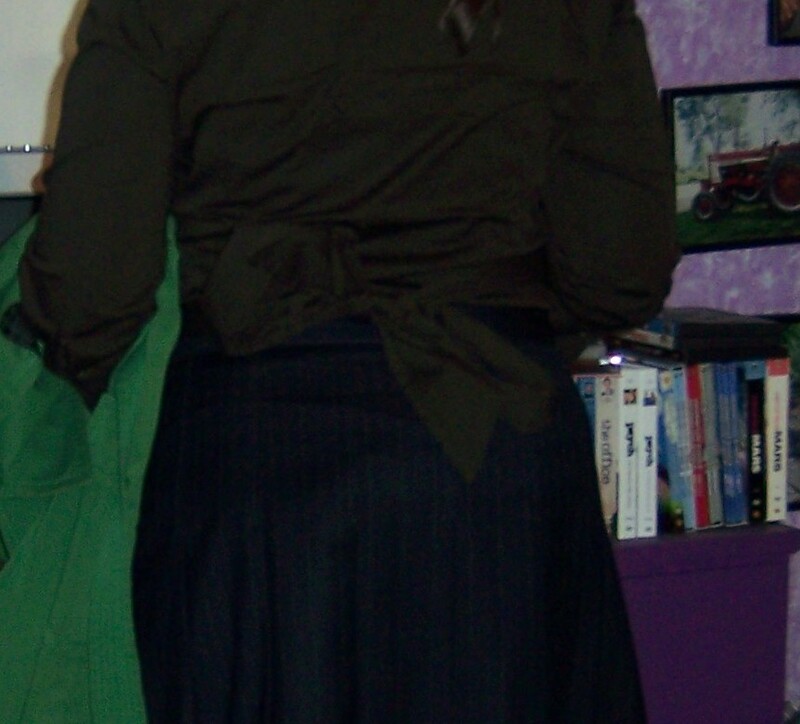 The longer skirt on the dress also keeps the outfit work appropriate. These tights would not work in a work setting with a shorter dress. This outfit also blends trendy (open weave tights and tall boots) with a classic look (dress with a cardigan belted on top of it). 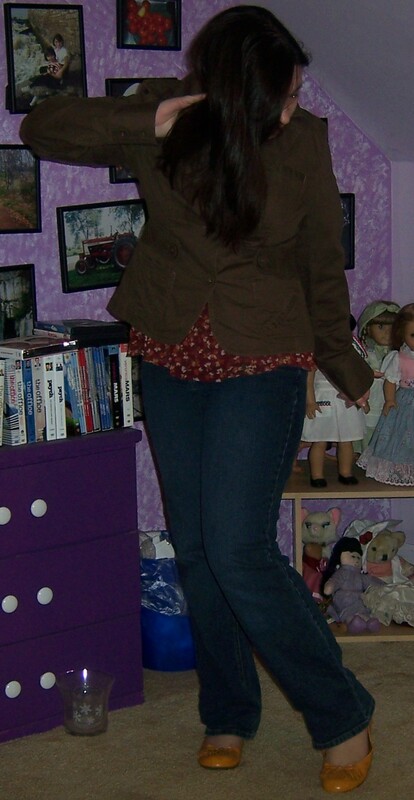 Overall, I was pretty pleased with this outfit. It’s one of my favorites that I’ve come up with in a while. I wore this on Wednesday–my long day. Dressing up on my most exhausting day of the week helps me get through it a little easier. So what about you? Is your style trendy or classic? Do you ever feel self-conscious about trying new things? If so, how do you overcome that? Finally A New Outfit Post! I haven’t done an outfit post in months, but I was happy with this one I put together this afternoon, so I thought I should share. I am so. close. to being done with this semester. I have four papers due this coming week. Two are completely finished, printed out, and ready to be turned in. The third I revised today and I’m waiting for others eyes to look over it before I print it out. That leaves the final paper, which I’ve been trying to work on tonight. It’s supposed to be 15 pages. I know what I’m writing about. I’ve read all of my sources. I just made my outline. But I am still a little concerned over whether or not I can get 15 pages out of it. As soon as I finish with this post I am going to write the introduction and hopefully come up with a thesis. If I can get that done tonight, I will feel a lot better about the whole thing. I’ve had Bones on tonight while working on my paper. It usually doesn’t distract me too much since I know it so well. However, tonight I probably shouldn’t have chosen “The Woman in Limbo.” It is distracting me. Love that episode! I’ve been doing a lot of cooking and baking lately, and I have some pictures and recipes to share with you soon. I usually try to space out my fashion posts because I don’t want this blog to be just about fashion. But I am not in a very creative mood today so it’s either fashion or nothing. I am not a huge fan of this outfit. I wanted to wear a dress, but I also wanted to be warm at work (our offices are in the basement so it gets chilly down there sometimes). Oh well, they can’t all be winners. And taking pictures helps me to better realize what works and what does not. I feel like the peasant top gives this outfit a ’70s vibe. I picked it up at a bargain a while ago, but I’ve only worn it this one time so far since, until recently, it’s been too cold to wear it. I know I’ve fallen down on the job, blogging-wise, over the past week or so. It’s been a combination of being extremely busy during the day and tired at night, plus now I think I am fighting something off. I am trying to get back on track though. I worked this morning so I decided to spend this afternoon getting caught up on blogs and news and hopefully I can get some reading done tonight between Chuck and Castle. My work schedule this work is very AM-centric, so I’m hoping for some productive afternoon. We’ll see.